We left Lake Bled and headed to the Dolomites, in the northeast of Italy - a place Will and I were both excited to see. We booked to stay at a beautiful alpine hotel called Rosalpina which was set amongst the backdrop of the Dolomites. No words can describe the view you are presented with, as you walk through this hotel towards the panoramic mountain range - it is something that has to been seen with your own eyes! If you're wanting to escape from the hamster wheel life that we run on - then Roselphina is the place to do that. It's without doubt the ULTIMATE nature getaway. It is run by an Italian couple who have put everything into making this place feel like a home away from home (although way more luxurious than our home). Everything, from the landscape to the interior, restaurant, food and service, is impeccable. 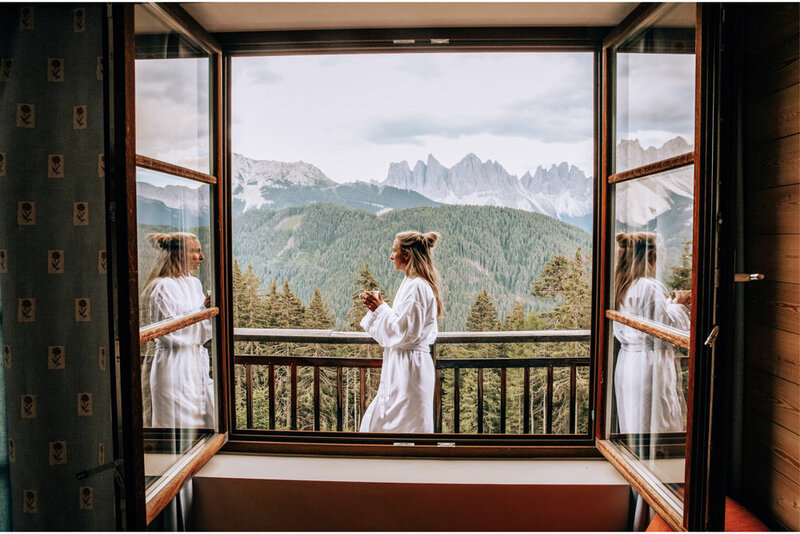 Roselphina offers lots of different activities such as, hiking, yoga, bike tours and a spa, but is also open in the winter months, where skiing is a stones throw away. Although I very much love the Alps in the winter, there is something particularly refreshing being amongst mountains in the summer. We were given a lovely suite which consisted of a bedroom, kitchen / living area, bathroom and a jaw dropping balcony. Having this amount of space, after living in Pat for weeks - was pure HEAVEN! We didn't know what to do with ourselves. Roselphina offers lift passes, which I highly recommend getting, as they give you access to a chair lift up the mountain - where you can then enjoy a 2-3 hour hike, where you'll meet lots of cute animals on the way! Obviously, if you're more of a serious hiker - I am sure you can skip the chair and walk. We spent two nights at this exceptional hotel, enjoying delicious food, wine, hiking, relaxing by the fire. We were lucky enough to witness one night, the Alpenglühen, also known as the alpine glow! This phenomenon happens when the sun is hidden for the low-level observer, but the top of the mountains may be in direct sunshine, which turns them into a red / orange tint. We left Roselphina after 2 nights, feeling fully charged to carry with the rest of our road trip! Thank you to everyone at Roselphina for making our stay truly memorable, next time we'll come back in the Winter.